Aves Noir | Raven Poo – Good Luck Omen? Raven Poo – Good Luck Omen? One of the oddest old adages states that getting a headful of bird poo is actually quite a lucky event. We believe this has more to do with the odds of it occurring (one in a million) than it has anything to do with the conditioning properties of the poo itself. The amount of luck present in any particular poo seems to beÂ directly influenced by the type of bird doing the pooping. Since we know corvids are infamous poopers (but not quite as infamous as pigeons which are completely unlucky), it is no surprise thatÂ the Raven is the harbinger of the most auspicious payload. As any person may correctly assume, seeing a bird suddenly fall dead from mid-air is a very ominous sign. This is especially true when it concerns the Raven. In 323 AD, Alexander the Great entered the great city of Babylon and a flock of Ravens fell dead from the sky. A few weeks later Alexander, predictably, was dead. Magpies are ominous birds that foretell the future, according to the size of the group that they travel in. Magpies are believe to be cursed by God for not mourning properly and not wearing all black during the Crucifixion. In Scotland, Magpies are thought to be so evil that each has a drop of the devil’s blood under its tongue. 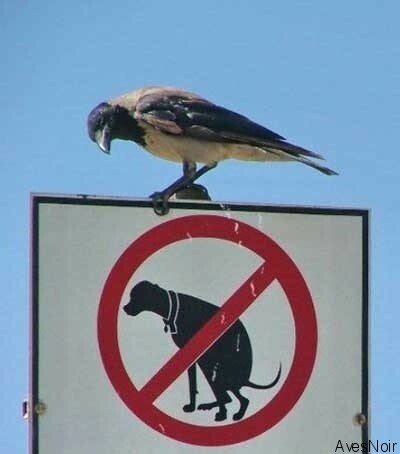 However, if either of them so happen to poop on you, consider it a blessing. 1. If you are unlucky enough to see a crow or magpie on the road, all is not lost. All you have to do is cross yourself, raise your hat to the bird, spit three times over your right shoulder, and proclaim “Devil, Devil, I defy you!”. Of course, if you don’t have a hat, then your out of luck. 2. if you live in an area were magpies are common, it would be best for you to carry an onion with you at all times. In the end, getting pooped on by a bird does not necessarily mean good luck. It’s very important to look up and see what kind of bird has left you this present. A Raven or an Owl is more often than not a good sign. Magpies and Crows, on the other hand…we can’t be certain, so just duck your head and make a wish!